The 29-Day Giving Challenge: Christmas isn't the only season for giving. — hannah brencher. The 29-Day Giving Challenge: Christmas isn't the only season for giving. You wake up to the sound of the alarm clock anxiously clutching your eardrum. Your fingers fool with the "snooze" button twice before you finally make an effort to lift your head from the feather down pillow, imprinted with a good eight hours of sleep and a batch of sweet dreams. You stretch for a moment before placing your feet down on the cold floor, the room still dark from the shade that shields the first signs of sunrise. Groggy, you stumble to the bathroom to endure the grueling task of turning on the light and accepting the first sign of morning. Your eyes meet the wilderness in the mirror, a less-kept version of yourself, hair tousled and face tired. You lean up close to the reflection, real close, and say "I cannot wait to consciously give to others today." This happens nearly every morning, right? Well wouldn't that be something, if we awoke every morning and the first thoughts in our head were the chance to give to someone else, to devote our day to looking for someone who needs our help. What if we did this very thing, this gift-giving ritual to strangers and friends alike, every single day? Or what about starting with 29 days? We live in a world where those who have the most tend to think they have the least. It makes no difference whether it is material possessions or our own thoughts, we often don't have enough, we often are not enough. But this is when we need to realize, WE HAVE SO MUCH TO GIVE! We have such a oppurtunity to give ourselves to others, to help others out and yet we get so caught up in this world that screams at us to be individuals and to help ourselves or fall behind. 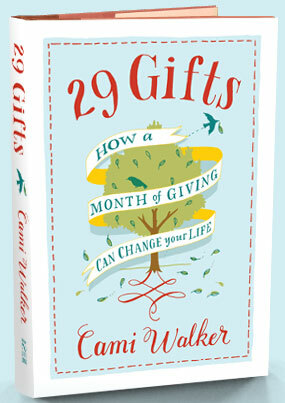 I read the book 29 Gifts by Cami Walker this past December, right after the season for giving officially ended in department stores across the nation. This is the story of a woman diagnosed with multiple sclerosis just a month after her wedding. After two yea rs of feeling bitter and angry, she consulted the help of an African healer who gave her the advice that would change her life: Stop thinking about yourself and start thinking about others. Give something away for 29 days. I could only imagine the way I might react if I were to visit an African healer with all the woes and heartbreaks that I could carry. I could imagine spilling them on the floor in front of her, expecting her to feel sorry for me or give me an herbal, and then she tells me to stop focusing on myself. She tells me to focus on others. Really? Are you crazy?! Well, she is on to something. By waking up with the intent in mind to look for ways to give gifts, our mind drifts away from anxiety, fears and sadness and towards compassion, gratitude and purpose. Now that sounds like some good medicine. After reading this book in nearly one sitting, I was determined to take on the challenge, to be the world's most selfless individual and to give all of myself for 29 days. Big Fail. I will be open in admitting this failure, I did not get very far at all before I became wrapped back up in my own little world of serving myself. But I am back at it again, wanting more than ever to give for 29 days. My drive and motivation to complete this challenge? Because I can make the world better by participating, because I can take the focus off of myself for once and put it on other people. It is all too easy to sink into my normal everyday routine and complete a thousand tasks solely devoted to my own advantage. But to take the shift from myself and put it on all those around me, well that's a challenge, one that I am trying once more to take on. I am feeling up to a challenge. With all this Olympic buzz still in the air, I am going for the gold and trying this out one more time. And I totally encourage you to join me! I would love to try this out with others by my side, I am sure we would have some great stories to tell throughout the 29-day journey. Come on now, who is with me?! Falling in Love: When did it become more complicated than calculus?